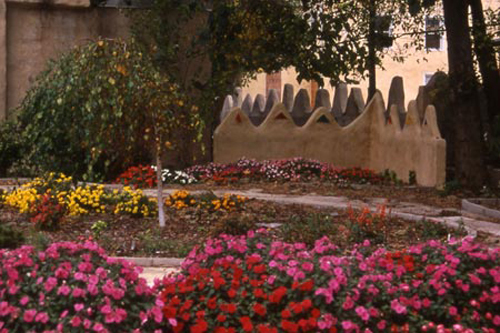 Located in the middle of the 2500 block of N. Warnock Street, the Magical Garden is in the heart of The Village. This abandoned land once contained six row homes that came to dilapidation and eventually were demolished by the City and buried underground. 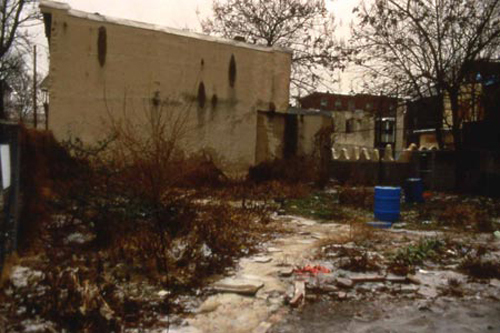 The lot gradually became a dumping site for trash, debris and human waste. So when we succeeded in constructing a garden on this site, we named it Magical Garden because the transformation of the place felt truly magical and momentous. 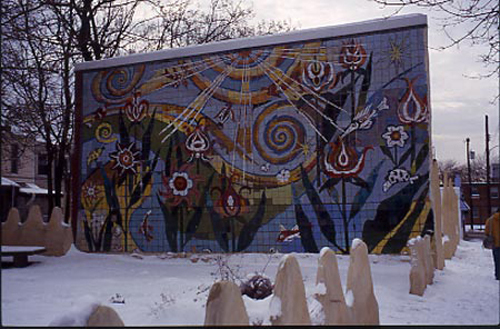 If one walks through Angel Alley, one will come to the Magical Garden from the back entrance guarded by two nine foot tall angels elaborately mosaicked by Village teens. 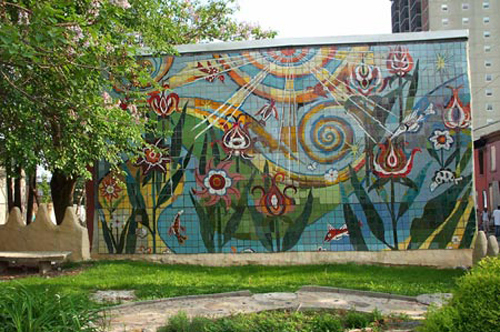 The Garden also contains a colorful fifty-five foot by eighteen foot tiled mural containing large, fancifully shaped flowers, stylized bird, fish, and insect life under the penetrating sunlight. 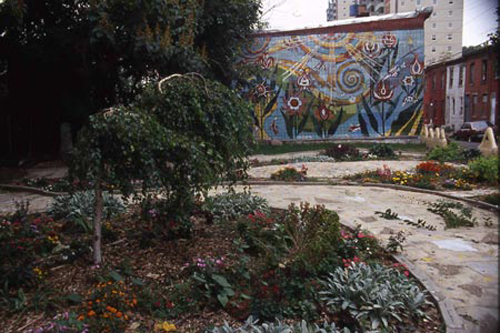 The Village crew constructed the garden with mostly recycled materials like stone slabs and irregular concrete pieces. We decorated the wet cement poured between slabs and concrete pieces with mosaic tiles with a refreshing and delightful result. Lily Yeh designed and produced the tiles. James (Big Man) Maxton and The Village construction crew installed them onto the wall. Philadelphia Green provided us with planting materials and technical support. This garden became a training ground for the Village teen urban greening program.